The East Bay Regional Park District Police Department is proud to announce the appointment of our new police officer who graduated from the Police Academy on Monday morning. Officer Lundin, a lifelong resident of the East Bay, entered the Alameda County Sheriff's Office 152nd Police Academy in October. She attended the 28-week basic recruit training academy, spent no less than 1,064 hours of formal instruction, and was tested in 28 different areas, including: laws of arrest, emergency vehicle operations, investigative report writing, physical fitness, defensive tactics and more. 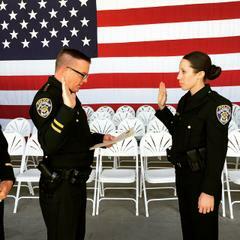 Officer Lundin performed well and was among the 64 graduates from her class, which included the newest members of the Alameda County Sheriff's Office and the Fremont, Hayward, and Livermore Police Departments. Congressman Eric Swalwell served as the keynote speaker during the graduation ceremony. He addressed the newly appointed peace officers, thanking them for their decision to work in a career that serves the public, while acknowledging the challenges that they will face in today's law enforcement profession. Officer Lundin began her in-house training on Tuesday and is excited to work for the East Bay Regional Park District Police Department to serve, protect, and promote a safe and pleasant park experience with integrity and pride.